Since crabmeat bought in the store comes from crabs that are picked by people in a factory setting, clean crabmeat and pick through looking for any pieces of shell or cartilage. Pick over carefully to and try not to break up any of the large chunks of crab. The better crabcakes are those that have nice big chunks of crab meat visible on the outside. Break bread into small pieces and moisten with milk; combined with the remaining ingredients and mix together well. Shape into four to six patties. Fry crabcakes in hot oil until browned; flip and brown other side. Instead of frying, you may broil for about five minutes to each side; turning pver when one side has browned. 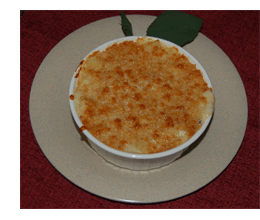 Serve with mayonnaise, tartar sauce or lemon wedges. Maybe served plain or on hamburger buns. Serve additional Old Bay Seasoning on the side. This is the classic recipe for which Old Bay Seasoning was created. At the time of the creation of Old Bay Seasoning crabs we’re so abundant in the Chesapeake Bay that they were served in bars and given away for free. The saltiness of this crab seasoning mix helped bartenders to sell more beer. The seasoning doesn’t actually get into the crabs, but instead stays on the shell and seasons the crab meat indirectly by hand contact while eating the crabs. So a variation of this recipe is to add the seasoning as the crabs are removed from the pot and are still wet (remember a little goes a long way). Use a large pot, such as a canner, with a raised rack in the bottom at least 2 inches above bottom of the pot (a round barbecue grill sitting on bricks or stones works well). Fill pot with equal quantities of vinegar and water to just below the level of the rack. 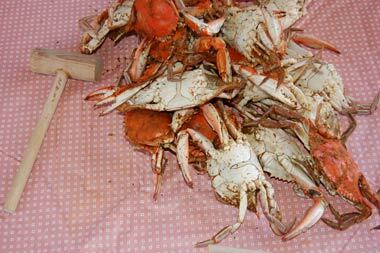 Add craps to pot in layers, sprinkling each layer of live crabs*** with the mixture of Old Bay Seasoning and salt. Cover and steam until crabs or red, about 20 to 30 minutes. Serve crabs immediately. Because seafood spoils quickly, keep crabs warm in steamer or promptly refrigerate. Serve steamed crab on a table covered with paper for easy cleanup and with plenty of cold beer. Melted butter seasoned with a little Old Bay Seasoning is often served on the side. Have plenty of paper towels handy. ***When adding crabs to pot, make sure the crab is alive. Crabs spoil quickly and any dead crabs should be discarded. Old Bay Seafood One Step seasoning is a great way to make a quick meal without thinking about how to blend spices and how much vinegar or lemon to add. Everything is already mix and is in the sealed package. Now, Old Bay Seafood One Step isn’t simply Old Bay Seasoning mixed with flavors of vinegar and lemon, it’s a mix with some interesting heat and flavors. We have already made a post about Old Bay Steamed Shrimp, so if that’s what you want here is the Old Bay Steamed Shrimp recipe. Here is a close up picture of Old Bay Seafood One Step Spicy Blend. If you look closely, you’ll see it’s made with a variety of spices. The official ingredient list on the box says “Ingredients: Spices (Including Red Pepper, Mustard Seed, Black Pepper, and Coriander), and Lemon Peel.” Looking at the picture of the spices in Old Bay Seafood One-Step I also see Whole Black Pepper, crushed Bay Leaves, Cloves, Fennel, & Poppy Seed. When you open the package you’ll know there is lemon peel in the mixture. Believe Me! So this is such a simple way to make steamed shrimp. What you do is bring 3 quarts of water to a boil in a large stock pot, and then add the Old Bay Seafood One-Step. Mix well, then add up to four pounds of shrimp, mix well, heat back to a full boil and cook over medium to high heat for 7 to 8 minutes or until done. Then drain and let cool some before serving (you can see the steam rising off our serving in the picture above). Serve with cocktail sauce. Old Bay Seasoning is an excellent blend of herbs and spices and has a natural affinity for seafood. Originally developed for use in the bars of Baltimore for seasoning the crabs they served, Old Bay Seasoning tastes great on many on seafoods. 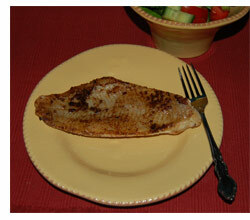 Our recipe today is Old Bay Seasoned Catfish Fillets and this one is about as simple as it gets. Yet it’s got a great flavor, both from the flavor of the fish, and from the excellent seasoning it receives. To make this recipe, simply season both sides of catfish fillets with Old Bay Seasoning, and pan fry until lightly browned, turn, and cook the other side. We used frozen catfish fillets in the recipe pictured here, and cooked the fillets for about 10 minutes on low for the first side, and 7 minutes after turning. If the fillets are really thick and meaty, you could use a lid on the pan while cooking the catfish on the first side so they thaw on the top while the bottom is cooking, and then cook uncovered after turning. Make one fillet per serving, and serve with a tossed salad.